mac and i: Offtopic: 500 followers, thank you all! OOOH well done! Keep it up! Congratulations on an epic milestone in blogging. Glad to help you reach such a milestone! Keep up the cool blog man. Whoa that's a lot! But for me it's nothing strange, since your blog is awesome! Keep working. Big congrats! That is quite a milestone! congrats! that is soo many! Also - Grats on 500! Haha, that's so awesome! Gratz on the followers! Grats on the milestone! Keep up the good work. What a milestone! That my goal this year! Amazing stuff... you're always blogging and putting up interesting posts. congrats man you deserve it. 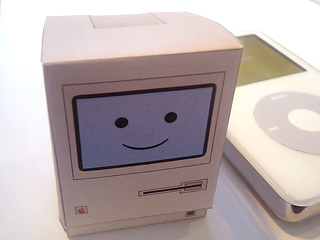 Aww haha papercraft mac is hella cute. Congrats! Following and supporting. Congrats! I'm glad I could be a part of it! You're a good man, you deserve it. sure :] congrats on the achievement. Congrats! I'm half the way to that. And congratulations. That's quite a lot. Congratulations on this great achievement! Hope that in some time you have 1000+, it's a great blog to mac users. Also I am still hearing "The knife - Marble house" you posted some time ago hah.